The F-35 Joint Strike Fighter flew supersonic for the first time yesterday, achieving another milestone. The aircraft accelerated to Mach 1.05, or about 680 miles per hour. 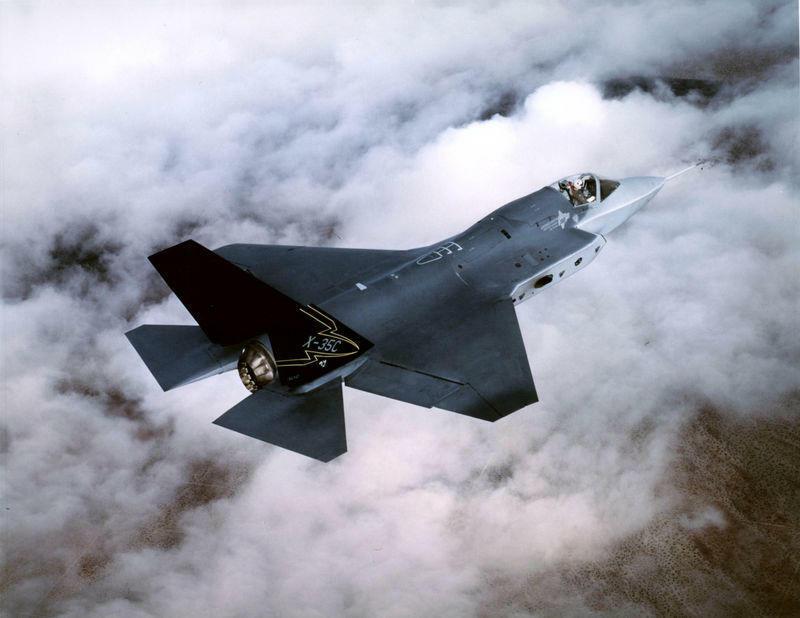 The test validated the F-35 Lightning II’s capability to operate beyond the speed of sound and was accomplished with a full internal load of inert or « dummy » weapons on the one-hour flight. Beesley said it was also a significant achievement for a test aircraft to fly supersonic for the first time with the weight of a full internal load of weapons. 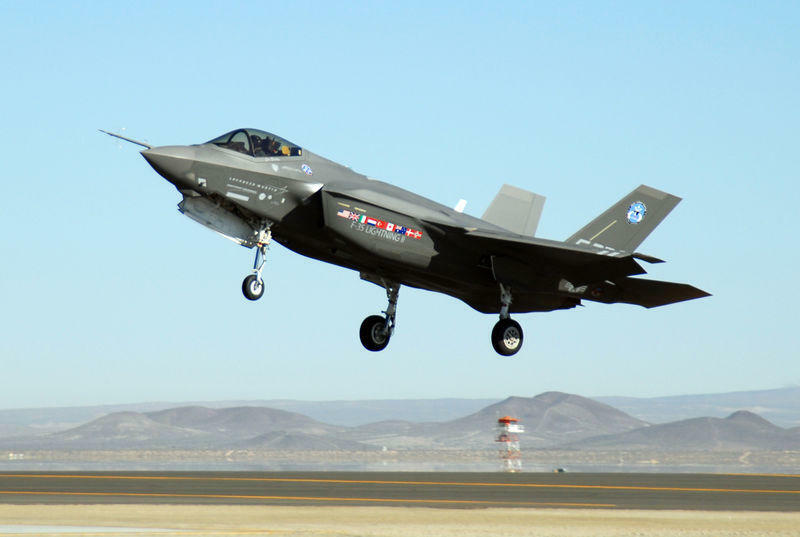 The milestone was achieved on the 69th flight of F-35 aircraft AA-1. Beesley climbed to 30,000 feet (9,144 meters) and accelerated to Mach 1.05, or about 680 miles per hour, over a rural area in north Texas. The F-35 accomplished four transitions through the sound barrier, spending a total of eight minutes in supersonic flight. The flight was preceded by a high-subsonic mission earlier in the day. Future testing will gradually expand the flight envelope out to the aircraft’s top speed of Mach 1.6, which the F-35 is designed to achieve with a full internal load of weapons. F-35 AA-1, a conventional takeoff and landing variant (CTOL), and F-35 BF-1, a short takeoff/vertical landing variant (STOVL), together have combined for 83 test flights. 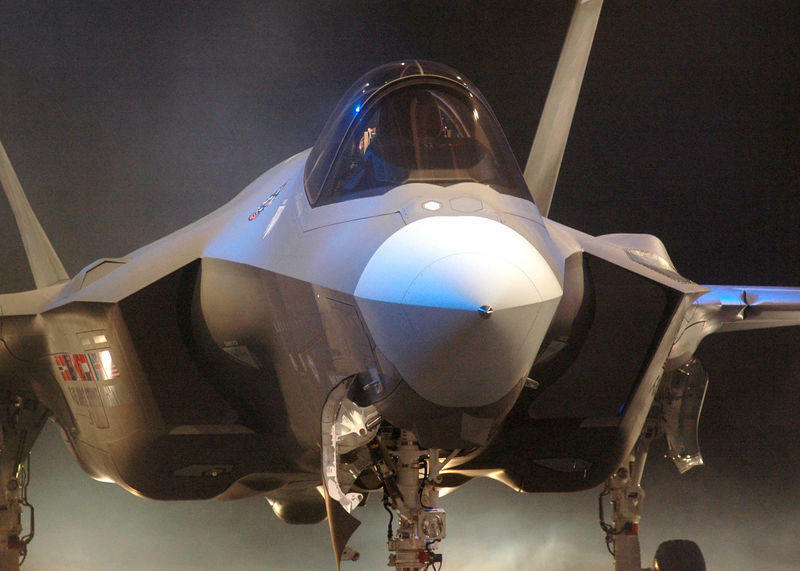 The F-35 is a supersonic, multi-role, 5th generation stealth fighter. Three F-35 variants derived from a common design, developed together and using the same sustainment infrastructure worldwide will replace at least 13 types of aircraft for 11 nations initially, making the Lightning II the most cost-effective fighter program in history. Two SR-71 aircraft were used by NASA as testbeds for high-speed, high-altitude aeronautical research. The aircraft, an SR-71A and an SR-71B pilot trainer aircraft were based at NASA’s Dryden Flight Research Center, Edwards, Calif. They have been loaned to NASA by the U.S. Air Force. Developed for the USAF as reconnaissance aircraft more than 30 years ago, SR-71s are still the world’s fastest and highest-flying production aircraft. The aircraft can fly more than 2200 miles per hour (Mach 3+ or more than three times the speed of sound) and at altitudes of over 85,000 feet. This operating environment makes the aircraft excellent platforms to carry out research and experiments in a variety of areas – aerodynamics, propulsion, structures, thermal protection materials, high-speed and high-temperature instrumentation, atmospheric studies and sonic boom characterization. Data from the SR-71 high-speed research program may be used to aid designers of future supersonic/hypersonic aircraft and propulsion systems, including a high-speed civil transport. The SR-71 program at Dryden was part of NASA’s overall high-speed aeronautical research program, and projects involve other NASA research centers, other government agencies, universities and commercial firms. One of the first major experiments to be flown in the NASA SR-71 program was a laser air-data collection system. 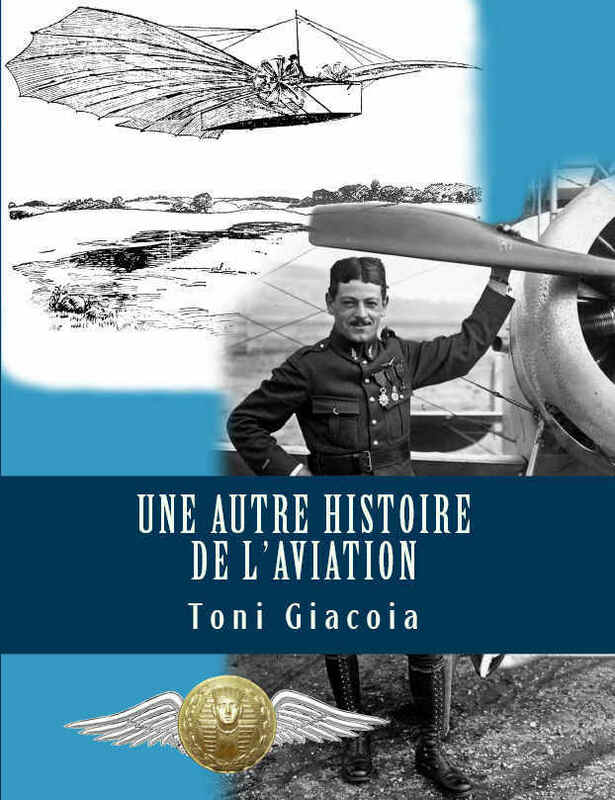 It used laser light instead of air pressure to produce airspeed and attitude reference data such as angle of attack and sideslip normally obtained with small tubes and vanes extending into the air stream or from tubes with flush openings on an aircraft’s outer skin. The flights provided information on the presence of atmospheric particles at altitudes of 80,000 feet and above where future hypersonic aircraft will be operating. The system used six sheets of laser light projected from the bottom of the « A » model. As microscopic-size atmospheric particles passed between the two beams, direction and speed were measured and processed into standard speed and attitude references. An earlier laser air data collection system was successfully tested at Dryden on an F-l04 testbed. The first of a series of flights using the SR-71 as a science camera platform for NASA’s Jet Propulsion Laboratory, Pasadena, Calif., was flown in March 1993. From the nosebay of the aircraft, an upward-looking ultraviolet video camera studied a variety of celestial objects in wavelengths that are blocked to ground-based astronomers. The SR-71 has also been used in a project for researchers at the University of California-Los Angeles (UCLA) who were investigating the use of charged chlorine atoms to protect and rebuild the ozone layer. In addition to observing celestial objects in the various wavelengths, future missions could include « downward » looking instruments to study rocket engine exhaust plumes, volcano plumes and the Earth’s atmosphere, as part of the scientific effort to reduce pollution and protect the ozone layer. The SR-71, operating as a testbed, also has been used to assist in the development of a commercial satellite-based, instant wireless personal comunications network, called the IRIDIUM system, under NASA’s commercialization assistance program. The IRIDIUM system was being developed by Motorola’s Satellite Communications Division. During the development tests, the SR-71 acted as a « surrogate satellite » for transmitters and receivers on the ground. The SR-71 also has been used in a program to study ways of reducing sonic boom overpressures that are heard on the ground much like sharp thunderclaps when an aircraft exceeds the speed of sound. Data from the study could eventually lead to aircraft designs that would reduce the « peak » of sonic booms and minimize the startle affect they produce on the ground. Instruments at precise locations on the ground record the sonic booms as the aircraft passes overhead at known altitudes and speeds. An F-16XL aircraft was also used in the study. It was flown behind the SR-71, probing the near-field shockwave while instrumentation recorded the pressures and other atmospheric parameters. In November 1998 the SR-71 completed the NASA/Lockheed Martin Linear Aerospike SR-71 experiment (LASRE). LASRE was a small, half-span model of a lifting body with eight thrust cells of an aerospike engine, mounted on the back of an SR-71 aircraft and operating like a kind of « flying wind tunnel. » During seven flights, the experiment gained information that may help Lockheed Martin predict how operation of aerospike engines at altitude will affect vehicle aerodynamics of a future reusable launch vehicle. Dryden has a decade of past experience at sustained speeds above Mach 3. Two YF-12 aircraft were flown at the facility between December 1969 and November 1979 in a joint NASA/USAF program to learn more about the capabilities and limitations of high speed, high-altitude flight. The YF-12s were prototypes of a planned interceptor aircraft based on a design that later evolved into the SR-71 reconnaissance aircraft. Research information from the YF-12 program was used to validate analytical theories and wind-tunnel test techniques to help improve the design and performance of future military and civil aircraft. The American supersonic transport project of the late 1960s and early 1970s would have benefited greatly from YF-12 research data. The aircraft were a YF-12A (tail #935) and a YF-12C (tail #937). Tail number 937 was actually an SR-71 that was called a YF-12C for security reasons. These aircraft logged a combined total of 242 flights during the program. A third aircraft, a YF-12A (tail #936), was flown by Air Force crews early in the program. It was lost because of an inflight fire in June l971. The crew was not hurt. The YF-12s were used for a wide range of experiments and research. Among the areas investigated were aerodynamic loads, aerodynamic drag and skin friction, heat transfer, thermal stresses, airframe and propulsion system interactions, inlet control systems, high-altitude turbulence, boundary layer flow, landing gear dynamics, measurement of engine effluents for pollution studies, noise measurements and evaluation of a maintenance monitoring and recording system. On many YF-12 flights medical researchers obtained information on the physiological and biomedical aspects of crews flying at sustained high speeds. From February 1972 until July 1973, a YF-12A was used for heat loads testing in Dryden’s High Temperature Loads Laboratory (now the Thermostructures Research Facility). The data helped improve theoretical prediction methods and computer models of that era dealing with structural loads, materials and heat distribution at up to 800 degrees (F), the same surface temperatures reached during sustained speeds of Mach 3. The SR-71 was designed and built by the Lockheed Skunk Works, now the Lockheed Martin Skunk Works. SR-71s are powered by two Pratt and Whitney J-58 axial-flow turbojets with afterburners, each producing 32,500 pounds of thrust. Studies have shown that less than 20 percent of the total thrust used to fly at Mach 3 is produced by the basic engine itself. The balance of the total thrust is produced by the unique design of the engine inlet and « moveable spike » system at the front of the engine nacelles and by the ejector nozzles at the exhaust which burn air compressed in the engine bypass system. Speed of the aircraft is announced as Mach 3.2 – more than 2000 miles per hour (3218.68 kilometers per hour). They have an unrefueled range of more than 2000 miles (3218.68 kilometers) and fly at altitudes of over 85,000 feet (25908 meters). As research platforms, the aircraft can cruise at Mach 3 for more than one hour. For thermal experiments, this can produce heat soak temperatures of over 600 degrees (F). The aircraft are 107.4 feet (32.73 meters) long, have a wing span of 55.6 feet (16.94 meters, and are l8.5 feet (5.63 meters) high (ground to the top of the rudders when parked). Gross takeoff weight is about 140,000 pounds (52253.83 kilograms), including a fuel weight of 80,000 pounds (29859.33 kilograms). The airframes are built almost entirely of titanium and titanium alloys to withstand heat generated by sustained Mach 3 flight. Aerodynamic control surfaces consist of all-moving vertical tail surfaces above each engine nacelle, ailerons on the outer wings and elevators on the trailing edges between the engine exhaust nozzles. The two SR-71s at Dryden have been assigned the following NASA tail numbers: NASA 844 (A model), military serial 64-17980, manufactured in July 1967, and NASA 831 (B model), military serial 64-17956, manufactured in September 1965. From 1991 through 1994, Dryden also had another « A » model, NASA 832, military serial 64-17971, manufactured in October 1966. This aircraft was returned to the USAF inventory and was the first aircraft reactivated for USAF reconnaissance purposes in 1995. The SR-71 last flight took place in October 1999. 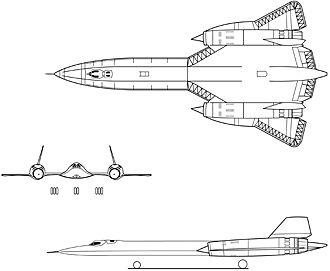 The basic design of the SR-71 and YF-12 aircraft originated in secrecy in the late l950s with the aircraft designation of A-11. 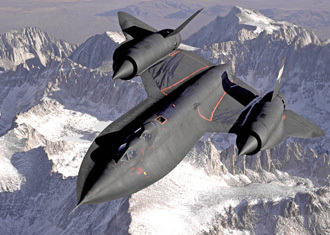 Its existence was publicly announced by President Lyndon Johnson on Feb. 29, 1964, when he announced that an A-11 had flown at sustained speeds of over 2000 miles per hour during tests at Edwards Air Force Base, Calif.
Development of the SR-71s from the A-11 design, as strategic reconnaissance aircraft, began in February 1963. First flight of an SR-71 was on Dec. 22, 1964.